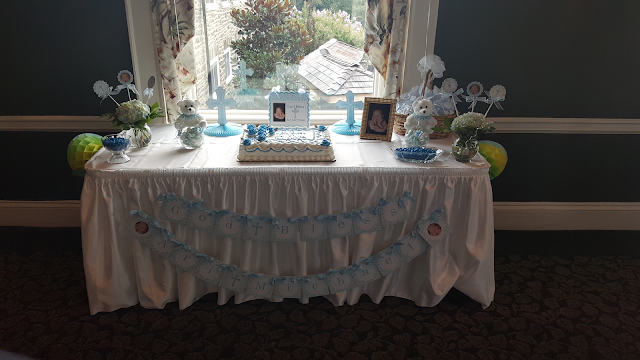 Recently, I was contacted by the grandmother of Ari Michael to make these very special decorations for the celebration of her grandson's christening. She had found similar decorations on Etsy, and had contacted the seller to do a rush order, but the seller was unable to do the project in time. I stepped in and was able to complete this project in just a few days. I put a little bit of my own spin on the Etsy seller's designs to make this precious banner, flower inserts and door sign. Directions: To make the banner, I cut chipboard pennants using a album scoreboard die by Sizzix and my Big Shot machine. The background paper is by American Crafts from A.C. Moore; the light blue and white solid cardstock is A.C. Moore's open stock (on sale last week for just $1.00 for 8 sheets!) I cut the flower inserts (they're like cupcake toppers, on lollipop sticks) and the sign's scalloped square background using my Cricut Explore. I cut the letters in the inside of a white doily by "attaching" the letters to a Cricut Design Space doily file. The crosses in the banner and on the top flower insert are cut using Sizzix dies. The other two are printed on my computer. If you have a special project that you need help executing -- with or without your own involvement in my craft room -- please don't hesitate to contact me. I'm happy to help! Let me help YOU make your next event a little extra special, by doing, brainstorming or helping you make your projects. I can be reached by e-mailing me at cardmonkey@Comcast.net. Just stunning Christening decorations! Loved the party setup and the choice of colors. At one of the local event halls for rent we recently attended a pre Christmas party. There was so much fun. From food to the décor, everything was arranged so professionally.